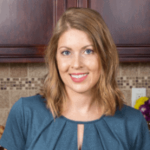 Published: Oct 26, 2017 · Modified: Apr 11, 2019 · By Jen Sobjack · This post may contain affiliate links. These Baked Apple Fritters are so delicious. 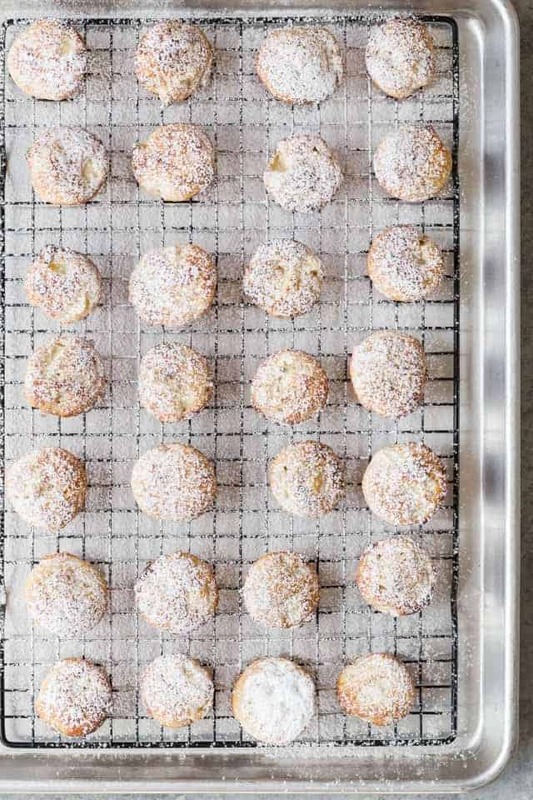 With hints of warm cinnamon and nutmeg, these fluffy delights are so tasty, you will be popping one after another into your mouth. Apple fritters that are baked and not fried!! That’s right. These little pillows of goodness are just as good as the ones from the fair without all the added fat from frying. Yep. You can forget about greasy fingers while enjoying these baked apple fritters that are also made without yeast. Say what!! They’re a must-have for cold weather! Just like these easy baked apples I made the other day! You probably already know, I am all about apple desserts. Well, anything apple really. Especially when it’s an apple cinnamon scone or apple streusel muffin (omg, they are delightful!). Not too long ago I devoured an apple pie with brown butter crust AND apple streusel bars. I just can’t help myself. Apple is my happy place at the moment. So let’s talk about how to make another fabulous apple treat. 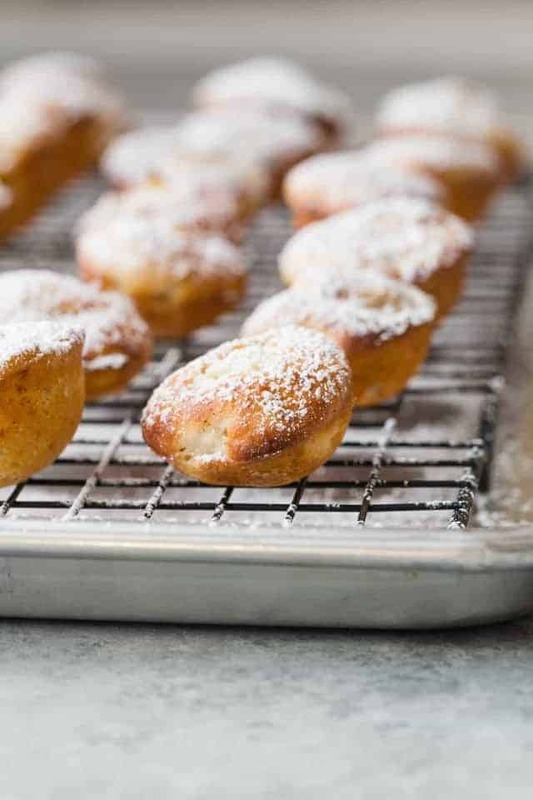 These fritters are like a cross between a muffin and a donut. Soft but sturdy and full of apple chunks, cinnamon, and nutmeg. To keep them moist I use a mix of butter and plain Greek yogurt. They bake up so rich, tender, and fluffy. 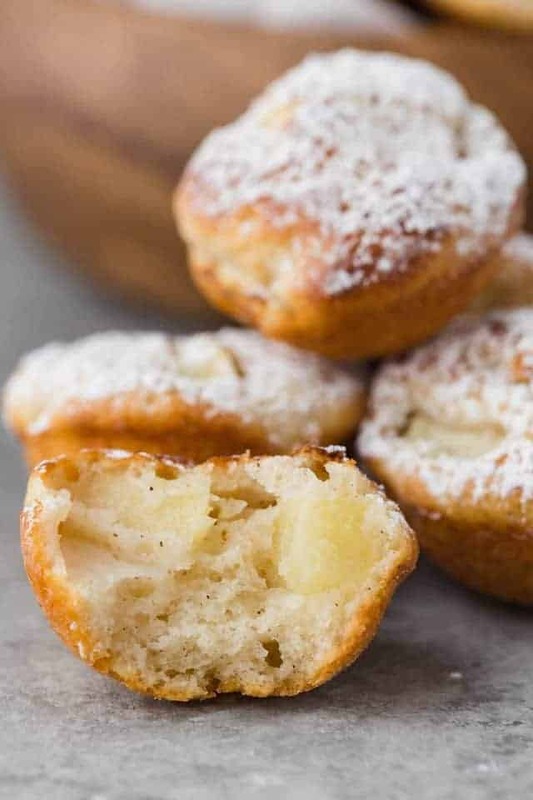 The fritters come together with basic ingredients like sugar, butter, egg, flour, baking powder, salt, cinnamon, nutmeg, yogurt, vanilla, and of course apples. I like to Granny Smith for the fritters since the batter is quite sweet. But feel free to experiment and use your own favorite variety or mix a couple different varieties together. 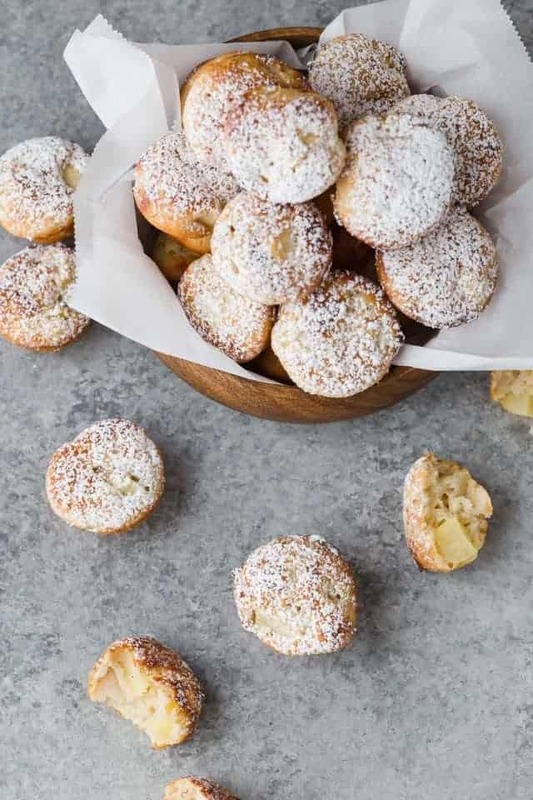 These baked apple fritters are basically mini muffins. 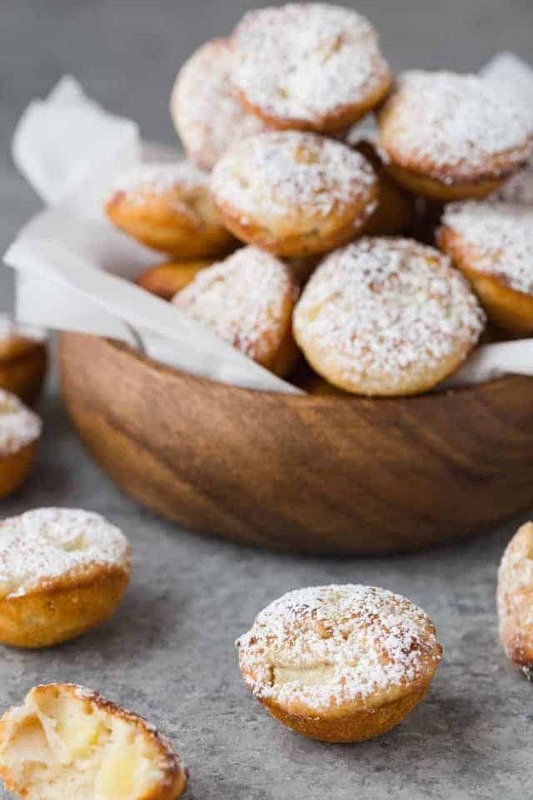 The batter is your typical muffin batter and it can be baked in a mini muffin pan or a donut hole pan. I baked half the batter in each of the pans mentioned and had excellent results with both. The tops of the fritters don’t brown as nicely as the bottom. To solve this issue, I set the fully cooked fritters under the broiler for a couple seconds. With a quick toast, they became more uniform in color the way a fried fritter would be. Just stay close by because they will burn quickly. It only takes a second or two to go from brown to burnt. I enjoyed these baked apple fritters with a light dusting of powdered sugar and a generous dunk in homemade caramel sauce. It was phenomenal! Preheat the oven to 350ºF. 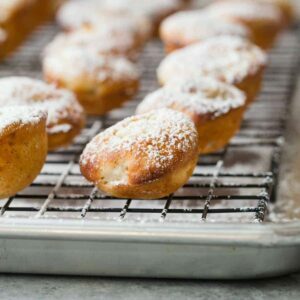 Lightly coat the cups of a mini muffin pan or a donut hole pan with cooking spray. In a large bowl beat the sugar and butter together until fluffy. Beat in the egg followed by the vanilla. Add the yogurt and beat until well combined. In a separate bowl, combine the flour, baking powder, salt, cinnamon, and nutmeg. Stir with a whisk. Add to the butter yogurt mixture and gently fold with a rubber spatula until the batter comes together. Gently fold in the apples. Bake for 15-17 minutes or until a toothpick inserted into the center comes out clean. Remove the fritters from the oven. Using oven mitts, adjust the rack to the second position from the top. (Use caution, the oven is still very hot) Turn the broiler to high and wait 3 minutes. Transfer the fritters to a wire rack to cool for 5 minutes. Dust the tops with powdered sugar and serve with caramel sauce for dipping. Fritters are best enjoyed right away. You can keep leftover fritters for up to 2 days in the refrigerator. They can be frozen for up to three months. Thaw in the refrigerator overnight then reheat before serving. *I used Granny Smith apples because I like the tart contrast with the sweet batter. You can use any variety you desire.